It's interesting that Sladen's tenure as Sarah Jane Smith was actually longer than some of the Doctors. Starting in 1973 in The Time Warrior with Third Doctor Jon Pertwee, she stayed on through the end of his time and went on to work with Tom Baker's Fourth Doctor, leaving in 1976 at the end of The Hand of Fear. In an interesting bit of history, Sladen has the honor of being the Companion to have worked with the most Doctors as a Companion from both the classic and revived series: a total of Four Doctors (Pertwee, Baker, David Tennant, and Matt Smith), that is if you don't count her appearance in The Five Doctors, which would bump her Doctor Count to seven. (Side note: in The Five Doctors, how could you NOT have had an anniversary special without Sarah Jane Smith? Sadly, she will not be here for the 50th Anniversary in 2013. Breaks my heart). As stated, Sladen is the only (so far) Companion to have returned to Doctor Who itself after the show's revival. It would make sense since her job as an investigative journalist would put her in a position to uncover secrets. In fact, her character Sarah Jane Smith was something quite different when she came on the scene. The intent was to make this Companion stronger, less of a screamer. Sarah Jane is very open about being a feminist, a person who won't stand by helplessly as previous Companions might have. In The Time Warrior, if memory serves correct, she seems rather appalled at how the characters, particularly the women, appear to not take stands against the Sontarans. Sarah Jane was different than previous Companions in that she wasn't going to be patronized by The Doctor. The fact that he was a male was not a reason to be talked down to or put aside 'for her own protection'. In later years Sladen may have thought her character was very 'cardboard', but I never got that impression when she was performing. I got Sarah Jane's intelligence, strength, and warmth both in the classic and revived series, and it's a credit to her acting ability that those qualities came through even when the scripts didn't quite measure up or when she was placed in ridiculous situations (prime example, her 'rescue' from a gentle slope as writer Terrance Dicks put it in The Five Doctors--not to mention her terrible costume in the same episode). 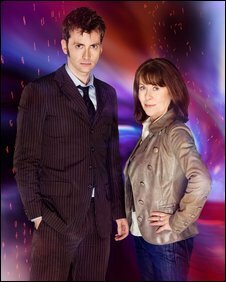 In a Doctor Who Magazine poll in 2009, Sarah Jane Smith was voted Favourite Companion, and it is an interesting result given how vast the history of the show is. She was the clear winner with 22.51%, putting her 7% higher than the second choice (Donna Noble, Companion to the Tenth Doctor--I personally feel that Catherine Tate's second-place win was due more to the fact that she was THE Companion at the time of the polling than to her overall effectiveness as a Companion, so she may have been better remembered, but I digress). It wasn't as if she didn't have some stiff competition: some of the Doctor's Companions have been simply wonderful: from Jamie McCrimmon to Jo Grant to Leela and both Romanas right down to Ace and Rose Tyler, there have been some truly brilliant characters that were not alien. Still, why was it that Sarah Jane Smith, a character that had not appeared on Doctor Who since 1976 (barring The Five Doctors and Dimensions in Time) and that many of the revived Doctor Who viewers were not even alive to have seen her on the show, ended up the winner? I think that it was because Sarah Jane Smith was a perfect combination of strength and vulnerability. She was tough, she was fearless, but she also knew the dangers involved. Someone like Jamie or Leela would go rushing into a fight, while other Companions like Susan Foreman or Peri would be more wary. Sarah Jane could do it, and do it well, but she wasn't belligerent. Sarah Jane knew enough to understand fighting was necessary, but that there was a cost to it. Also, there was something likeable about Sarah Jane Smith and Elisabeth Sladen. I'll say it if no one else will: she was pretty, and she had a genuine sweetness to her. However, there was more: we saw a caring nature to Sarah Jane, both for The Doctor and her own adopted family on The Sarah Jane Adventures. The genuine affection she had came through, and I think that was the case not just for Sarah Jane Smith but for Elisabeth Sladen. There didn't seem to be a drop of maliciousness in her. She seems a likeable person, witty, pretty, and highly intelligent. It is difficult to identify with some Companions: the aristocratic Romana or the aggressive Leela or the Queen of Scream Mel Bush for example. There was never that problem with Sarah Jane; she was someone we could relate to: a mix of fighter and mother (she did adopt Luke in The Sarah Jane Adventures), a person whom you could rely to protect you and fight alongside you. In short, we LIKED Sarah Jane: we liked her when she was putting up with The Doctor, we liked her when she mocked The Doctor (as she did when sharing stories with Rose Tyler in School Reunion). It's that likeability (both of Sarah Jane and Elisabeth Sladen) that made her such a hit with fans. I figure The Sarah Jane Adventures, as well as Sarah Jane's Alien Files, will come to an end if they hadn't already. That's the technical aspects of Sladen's death. The emotional one is more daunting: a woman who appeared pleasant and warm, joyful and brave, one who didn't shrink from a fight--it could describe both character and actress. It pains Doctor Who fans to know that she is gone, and it is one of those curious notes of history that both The Brigadier and Sarah Jane Smith (two of the most iconic humans in the Doctor Who canon) both left us within such a short span of time. I freely admit that when I heard the news, I was overwhelmed and did what I don't remember doing for any actor: I cried when I heard that Elisabeth Sladen died. I cried deep tears of sorrow, and felt so sad that I had to go into the bathroom to collect myself. The Eye of Harmony, having been dimmed for The Brigadier, now dims in tribute to Elisabeth Sladen. Fare thee well, Our Sarah Jane Smith. The Reasons We Love The Smiths.